￼While you control no non-[Cthulhu] cards, Akhlut gains a [Terror] icon and other Monster characters you control gain [Combat] [Combat] icons. Flavor Text: The Inuit believe the beast could be recognized by wolf tracks that lead to and from the sea. Chosen for #CardoftheDay for June 16th, 2015, primarily because I've been tinkering with a Cthulhu/Hastur deck that uses Cthulhu character and support cards, plus Hastur events, to try to take advantage of Akhlut and Asuilaak's "while you control no non-Cthulhu card" abilities. So far, it needs more tinkering. Akhlut seems like in a properly constructed deck it could be a threat, but hardly enough to win you the game, especially Cthulhu's lackluster monster roster. Maybe you use ocean crawlers as your one drop, and guardian shoggoth and the thing from the shore are both notoriously good khopesh wielders, but I feel like Akhlut probably doesn't make up for the all benefits you could gain from characters from other factions. Performance Artist alone is probably better than Akhlut in a Khopesh deck. That being said, I love the tough Cthulhu characters+destruction mixed with strong Hastur control deck--history has shown that such decks can compete at the highest levels. I think probably Serpents (for more icons) or Deep Ones (for more control) are the way to go, though, rather than monsters. I feel they went too far in trying to balance Akhlut by saying non non-Cthulhu cards. That combined with how there are only 12 Cthulhu Monsters, with only 3 of them cost 2 or less, it feels like if it was made early in the game to allow them to make cards that support it, this card could have been amazing. But, the great thing about the game is when people such as yourself blinovitch prove me wrong with decks around cards like this is why I love the game. I don't find him to be an overly strong character. He's 3 cost, so you've got to invest a bit to get him on the board, and then to get any real mileage out of him at all you need to forgo other factions (including neutral cards) and run monsters. As has been mentioned, Cthulhu monster subtype is lackluster. I think the short of it is that this card needs to be built around to make it worthy of inclusion into a competitive deck, but the building blocks just aren't there to make it a strong concept. 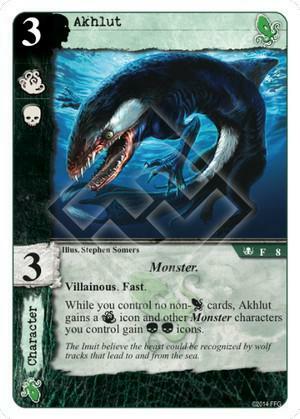 I feel they went too far in trying to balance Akhlut by saying non non-Cthulhu cards. Exactly. I'd love this card if it wasn't restricted to mono-Cthulhu decks.